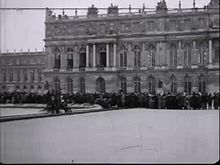 The Treaty of Versailles (French: Traité de Versailles) was a peace treaty between the nations of Japan, the United States, France, Austria-Hungary, Germany and Britain after World War I. The treaty was made in 1919. Germany, Austria and Hungary did not participate in writing it. Germany had the choice between signing it or facing the occupation of Germany by Allied troops. The French made the Treaty hard for the Germans so that Germany would not be able to start a new war. Thus, Germany had to reduce its armed forces from 6 million to 100,000 men, and get rid of its submarines, military aircraft and most of their artillery. Their Navy battleships were limited to only six small ones. Germany also had to give back French territories it had occupied, as well as large territories of its own to Poland and other neighbours, and it had to give up all of its colonies to the League of Nations. Germany was to pay back the very big World War I reparations for the damage done to Allied countries, mostly France, during World War I by German troops. This sum was to be very large but was not yet fixed. 132 billion gold marks had to be paid only as a first part of the German debt. The Treaty made a League of Nations which was intended to make decisions and keep peace after the treaty was signed. The League solved some international disputes without war, but could not stop World War II. This Treaty can be seen as a one-sided peace, dictated to Germany. The English economist John Maynard Keynes thought it was a great mistake to force such harsh measures on the German people, but his advice was ignored. Germany set up the Weimar Republic. It was democratic, but suffered an economic collapse, with the hyper-inflation of its currency. Adolf Hitler became Chancellor and overruled the treaty. His actions eventually led to World War II. Germany had to give back French areas, (Alsace-Lorraine) taken by Germany in the Franco-Prussian War, that Germany had won in 1871 and was still an embarrassment for France. The French made Germany take its troops out of the Rhineland (the long stretch of land on Germany's border with France where the Rhine river flows), an important part of land for Germany where many factories and businesses existed. If Germany put troops back into the Rhineland the punishment would be France invading Germany. Germany also had to give parts to Poland, a country made out of Russian and Austrian parts and the Polish and Lithuanian people who lived in them. Poland was a strong kingdom a few hundred years before but Austria, Prussia and Russia had split it in the Partitions of Poland. Belgium was given Moresnet and Eupen and Malmedy. This is the main reason that Belgium now has a German-speaking community. Versailles also split up many large empires on the losing side. The U.S. President, Woodrow Wilson, thought this was a very good idea because many people in Europe wanted to be free from the big empires. But it also created problems. In a separate treaty around the same time, Austria-Hungary was split into many countries. One was Austria. Austria was meant to be the homeland of the Austrians, who spoke German and mainly ruled Austria-Hungary. Its capital was Vienna. One of the problems of Versailles was that many Austrians, like Adolf Hitler, thought that Austria was meant to be part of Germany. This later led to the Nazi German occupation of Austria. The new country of Hungary was also created. Like Poland, it was a country that was strong on its own centuries before. Its capital was Budapest. Another new country, Czechoslovakia was created to be the homeland of the Czechs and Slovaks. The Czech part was made up of the country once called Bohemia and Moravia. Its capital was Prague. Many Germans lived on its borders called the Sudetenland, which was why later Adolf Hitler insisted that it should belong to Germany. Bosnia, Slovenia, Croatia (which were parts of Austria-Hungary), northern Macedonia (which was part of Bulgaria), Serbia and Montenegro made one country, called Yugoslavia. It was made to be a Slav homeland, but there were many religious, language and national differences. New countries by the Baltic Sea called Estonia, Finland, Latvia and Lithuania were also created in other treaties after World War One. The Russian Revolution started during the war, and later resulted in the death of Tzar Nicholas II of Russia and the formation of a Communist state. A civil war raged in Russia between the anti-Communist White Russians and pro-Soviet Red Russians. Russia had lost control of its western territory which made up Estonia, Finland, Latvia, Lithuania and parts of Poland. Later during the Second World War, the Soviet Union would reclaim Estonia, Latvia, Lithuania, and half of Poland. Another treaty called the Treaty of Sèvres gave parts the defeated Ottoman Empire to the various victors. However, Greek and Turkish armies soon resumed fighting. The German Empire became the Weimar Republic. A big problem for Germany was to pay back a giant amount of money for the all of the damage done to the Allied countries, mostly France, during World War I. This made Germany one of the poorest countries in Europe for almost 20 years, and caused political fighting in Germany. The two most important parties, the Communists (who wanted a Communist revolution as had happened in Russia) and the Nazis (who thought Germany should become the most powerful country in Europe) fought for many years. As Germany owed a huge amount of money to the Allies, they started to get loans of the United States (called the Dawes Plan). When the Great Depression hit in 1932, the USA requested for all their money back. Germany couldn't pay and printed more and more money to pay debts. This led to hyperinflation and the Reichsmark was worthless. The German economy was shattered. Many Germans hated the treaty and some even wanted to fight more after Versailles. The League of Nations created after Versailles was usually not powerful enough to stop wars, either. Japan took Manchuria and the League was not able to stop it. Italy invaded Ethiopia and although the Ethiopian Emperor begged the League to help him, it did not. Germany, Japan and Italy became the Axis powers, and by invading many peaceful countries caused World War II. The United States and the USSR did not even join the League, even though it was the idea of US President Woodrow Wilson in the first place. The League was never taken seriously, even though it was created to make sure Versailles was respected. 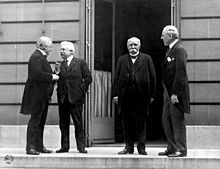 The treaty failed to keep peace in the end, and was a reason for Nazi Germany and Adolf Hitler to win the support of the poorer Germans to get rid of the "chains of Versailles", leading to World War II.
. Langley, Andrew. Living through World War II. Chicago, IL: Heinemann Library, 2012. This page was last changed on 22 March 2019, at 13:49.